Communities across the U.S. are discovering that Common Ground Thinking provides a proven civic framework to rebuild mutual respect and cooperation in the face of some of our deepest religious and cultural differences. Let BridgeBuilders President Wayne Jacobsen show you how it is done. We offer two highly interactive and engaging workshops that have proven successful in helping polarized groups cultivate the common ground. This training was originally designed for public educators and has been utilized at board and staff retreats, for professional development and in parent forums to offer school districts a fair and truly multicultural approach to dealing with their diverse constituencies. In recent years we have been asked as well to help businesses and community groups with a similar approach and have adapted versions of this training more appropriate to those environments. 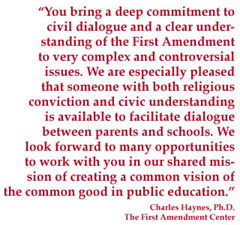 Resolving Conflict through Common Ground Thinking offers an appreciation of First Amendment civic principles that rebuild mutual respect and help divided groups find common ground solutions that are fair for all. (5 hour or 3 hour versions available) You can also review our Curriculum Outline. For educators, we custom create the kind of workshop that will best fit the audience and needs of your district. Adaptations of the first two workshops are available for specialized audiences of school board members, administrators, health educators, science and social studies teachers or parent groups. Question and Answers regarding our workshops | Hear a sample of Common Ground Thinking. If you want further information about our training workshops or presentations, or would like to schedule one in your community, please contact us. 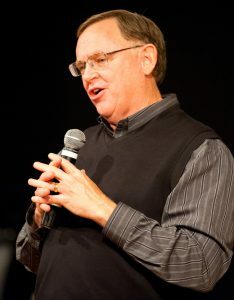 BridgeBuilders also provides one and two hour presentations entitled “Disarming Controversy Through Common Ground Thinking” for education, civic or parent groups.